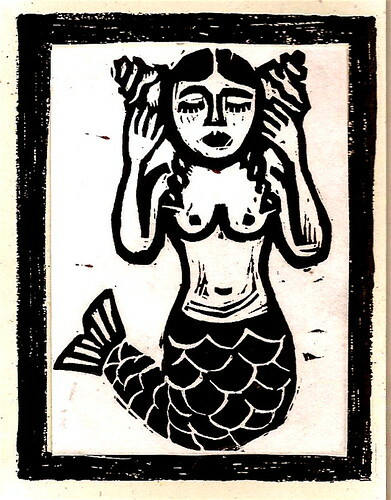 mermaid listening, originally uploaded by bbmarie. This is a new card design offered through my Etsy shop on line. I have a batch of new cards that I have made recently that I am putting into the shop to keep things fresh. I spend time drawing and redrawing to get designs that have a punch and poetry that excites me and then I cut the block. The new thing that I am doing is printing the cards one at a time by hand instead of having them printed up in quantity at Kinkos. This makes them cost a bit more $4.00 a card instead of $2.50 but they have that one at a time by done by hand vibe that is more potent and worth an extra $1.50. (If you have already done so, check out the studiobeerhorst Etsy shop on line by clicking on Etsy in the list of links in the side bar to the right.) Etsy is such a powerful tool and global online community of people making things with their own hands and doing what they can to make a living and stay true to their authentic self.